One of my favourite places on the Isle of Wight is the Ventnor Botanic Garden. The location of the garden means it is really well protected from the elements giving it a unique micro-climate. This means that they are able to grow many subtropical plants outdoors and on a sunny day it feels a million miles away from Great Britain. I never get the chance to see all of it in one visit, as my family are less enthralled by gardens than I am, so I have to prioritise the parts I want to see on any particular visit and make a beeline for them. One of the parts I’ve not made it to yet is the Hop Garden, where they grow the hops that will eventually become TropicAle, their own beer! One of the truths about going on holiday with small children is that it’s not terribly relaxing. Although its lovely to spend time together, without the daily grind of school and work to think about, it’s generally not going to involve much lazing around in the sunshine reading a book. More like relentless noise and activity, and sometimes, to be honest, I find it a bit overwhelming. On my flying visit to the Ventnor Botanic Garden this year, I decided to visit the New Zealand and Australia garden, one of my favourite parts. I love the Australian garden in particular as it is predominantly planted with Eucalyptus, the smell of which beings back memories of a wonderful trip across South Australia and Victoria, which I was stunned to realise the other day was ten years ago! On my way back to the playground to meet up with my family (and what a great idea to have a playground, making it possible for me to be there at all! 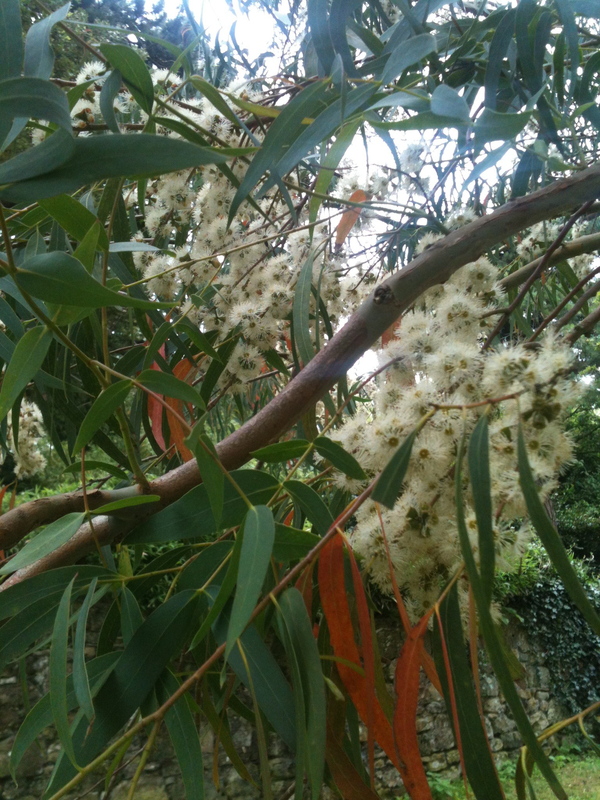 ), I was distracted by the most beautiful flowering Eucalyptus I’ve ever seen. Unfortunately I forgot to make a note of the name, but I will try to track it down because I’ve fallen a bit in love with it. The peeling orange-red bark, the fine pointed silvery-green and pink leaves, and the contrast between those and the white fluff of the flowers made for the most remarkable colour combination. I stood for ages just gazing at it, when I noticed an older woman doing the same thing. We chatted for a while about this amazing tree, then I confessed that I must go because I’d left my children and husband in the playground. On hearing this, she turned to me and said “Oh, but when you have small children, time spent alone is essential, my dear. Don’t ever feel bad about taking some time for yourself.” Then she smiled and went on her way. How do you like to find peace in a busy life? I’d love to hear about it.